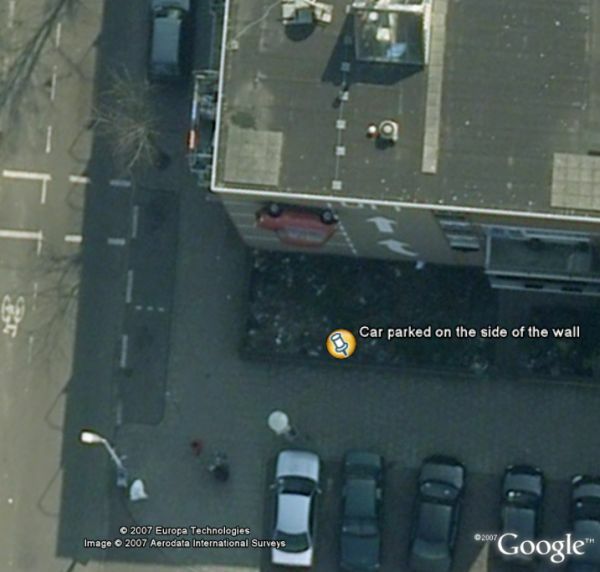 Google Earth Blog: Car Parked on Side of a Building - Not a Fake! It's a classic mini. Awesome. Hmm, some time ago (a few years) Mini ran an ad campaign that included sticking mini's on the sides of buildings. I know this happened in London but potentially across Europe? It may be un connected as they were new mini's not this classic mini. or how do i get the 12 hour update image thanks. In 1982 I took a photogragh of this car/wall that I stumbled apon when I was driving around lost. I printed a big beautiful solarized version that pops up from time-to-time. My piers have always thought it was a trick since I work lot with manipulating photographs. FINALLY I have proof without a trip to The Netherlands! Thank you so much!! Rotationg the image you should notice that there are arrows painted on the side of the building next to the car. There also appears to be annother vehicle painted on the building across from the arrows. My suspicion is that this is advertising or art and not a "real" auto yet still of interest. There's also one in South Africa - a mini on the side of a wall in a slingshot, like it's about to be fired off.